Continuing a hot streak that began in January in San Angelo, Texas, when he rode the first- and secondplace horse at the National Reined Cow Horse Association Celebration of Champions Derby, Chris Dawson, Jacksboro, Texas, claimed the NRCHA Stakes Open Championship Saturday, March 30 at the South Point Equestrian Center in Las Vegas, Nev., on his own horse, Travelin Jonez (Smart Chic Olena x Travelin With Sass x Travalena). Dawson piloted the 5-year-old stallion to a 664.5 composite score (221 herd/218 rein/225.5). "Everything just came together. It was unbelievable," Dawson said. The title paid $32,072 and came with a Bob’s Custom Saddle, Gist buckle and CR Morrison Trophy sponsored by the NRCHA; a pair of custom boots sponsored by Rios of Mercedes; and a $50 gift certificate and cooler bag from Santa Cruz Biotechnologies. The nominator of Smart Chic Olena, Travelin Jonez’s sire, will receive the NRCHA Champion Sire Award, a $4,000 check and CR Morrison Trophy. While the Celebration of Champions Derby win in San Angelo was the 31-yearold horseman’s first major reined cow horse title, the Stakes Championship elevated Dawson’s game yet another step higher, a payoff for the young horse trainer’s mandatory dues-paying years. "I asked a guy, a pretty good trainer, for some advice once. He said, ‘Keep your head down, work your tail off and hope for a little luck.’ That’s kind of what I’ve done, and I’ve had a lot more luck than anything," Dawson said. Travelin Jonez earned the high-scoring herd work of the finals, a 221, from his eighth working position in the second set. "We watched the cows really close in the herd, and I was kind of late in the set, but all had all our picks were still fresh so I just went and cut them. They were good cows. I just kind of hung him out there," Dawson said. In the rein work, Travelin Jonez ran down at blistering speed to some huge stops, getting everyone’s attention, including the judges’, who scored the run a 218. "The throttle stuck a little bit but the emergency brake worked every time, so it was all right. They were fast, by golly, but I told him before we went, ‘I’ll let you pick the speed, partner, as long as you do your job, I don’t really care.’ But it all worked out and he was good," Dawson said with a smile. "You get in there and you’re leading the deal, and it’s going through your head – ‘Man, I need to be big, or I need to be safe,’ or whatever. No, you just need to work that cow for what it is, and that’s what we did," he said. "I just thought, there are no scores tonight. We’re just working a cow, just like were at the house. We’ll just work the cow for what it is and not try and force anything, not try to make anything happen, and it all worked out. We made four turns and marked a big score [a 225.5, the highest of the round]." Dawson thanked his support team and his mentors, NRCHA Hall of Fame horseman Don Murphy and the late Harold Farren, who passed away last summer. "I can’t thank Don Murphy enough. He’s done so much for me. And then Harold Farren, he passed away last year, and without that guy, I don’t know where I’d be. I feel like between Don and Harold and my two late grandfathers, I’ve got a lot smiling down on me." The Stakes Open Reserve Championship ended in a three-way tie that included the Stakes Intermediate Open Champion, SDP Blue Blood (Laredo Blue x SDP I Got Good Genes) shown by Matt Koch for K & H Performance Horses; Oh Cay Meriah (Light N Lena x Meradas Oh Cay), shown by Todd Crawford for Russ Mothershead; and Wanna Winna Prize (Smokums Prize x Ill Be A Winning Gal), shown by Justin Wright for Winston Moore. All scored a total 653 on three events to earn $19,358. "Chris kept saying, ‘It’s the finals, just let it all hang out!’ So, in the herd work, I cut my first cow and just put my hand down and cut one-handed, all three cows, and he was really good. Same thing in the rein work. I watched Chris go first, and he was wideopen and going, so we tried the same thing and it worked. We survived the cow work and ended up here! Chris has been here before, and I’m pretty new to it all, so I’m just listening and taking lessons," Koch said, smiling. "My girlfriend rides him outside on days I don’t get to him. It lets him get out and be a horse. For me it helps out because you can leave him off. Today, I didn’t ride him until an hour or two before the show started," Koch said. NRCHA Open Bridle World Riding Shes Wright On (Hes Wright On x Sue C Shiner) for owner/breeders Garth and Amanda Gardiner, Ashland, Kans., Kelby Phillips captured the Stakes Limited Open Championship with a total 642.5 score (208 herd/214 rein/220.5 cow). 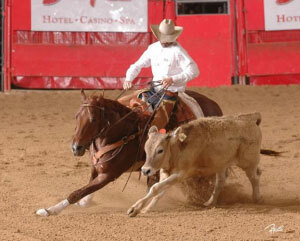 The Limited Open title paid $3,218 and came with a CR Morrison trophy and Gist buckle from the NRCHA. The Gardiners also received the $1,000 Champion Sire Award for enrolling Hes Wright On in the NRCHA Subscribed Stallion Program. 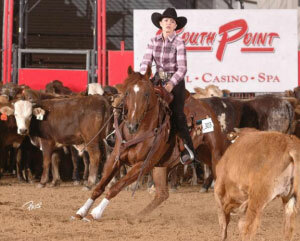 Shes Wright On also earned the Stakes Intermediate Open Reserve Championship, which paid another $4,320. "In the herd work, she felt a little tired from the prelims. She was better in the prelims. She was still good; I just cut really soft cows, which left us with some ground to make up. In the reining, she was good the whole time. I’ve had a little bit of trouble with her running and stopping but she really started coming on the last few weeks and really started being good. The fence work was the best she’s ever been at a show. She’s big down the fence at home, and it was nice to put it together here," Phillips said. As the resident trainer for Gardiner Quarter Horses, Phillips said he was pleased to ride a product of their breeding program into the winner’s circle. Shes Wright On is by the Gardiners’ stallion, Hes Wright On, and her mother, Sue C Shiner, is particularly special to Amanda. "It was her first cow horse, the first horse she learned to show in the bridle, so we went overboard on breeding Hes Wright On to her. We have more of that mating than we do of anything else," Garth Gardiner said. "It’s rewarding as an owner and a breeder to have a horse be successful, especially at a show like the NRCHA Stakes, where it’s all about the sire." Another Gardiner-owned mare, Fancy Boons N All (Peptoboonsmal x Smart Fancy Zan), also shown by Phillips, finished as the Stakes Limited Open Reserve Champion, earning $1,930 with a total 638.5 score (207 herd/217 rein/214.5 cow). Phillips thanked the Gardiners and his herd help, Brad Lund, Brandon Buttars, Todd Crawford and Robbie Boyce. "Most of all, I’d like to thank my fiancée, Abbie [Burtenshaw] for helping me. It’s been a long week. We haven’t slept hardly any, and I want to thank her for her help," he said. The couple’s wedding is less than two weeks away. "It's a very emotional day," Robinson said. "It's so exciting to be able to ride and compete again. I just can't believe it, and making the Open finals was something I never even considered!" Robinson, who is married to NRCHA Hall of Fame Horseman and seven-time Snaffle Bit Futurity Champion Ted Robinson, suffered a crushing injury to her lower left leg in a horse-related accident in 2010. At one point, doctors recommended amputation, and although the leg was saved, it has been very slow to heal. Robinson was unable to walk for 14 months, enduring six surgeries and a setback when the leg rebroke last fall. "It's been a nightmare, just a mess. They couldn't get it healed. The fact that I'm able to walk and ride is amazing," she said. "The traditional medicine wasn't working and the prescription drugs were wreaking havoc on my body and mind, so I got off all that and started acupuncture. It's made all the difference in the world," she said. "Especially with the fence work, I had to really think about trying to stay strong, if a cow bumps my leg, because it was so long getting healed, or if I hit the fence - it was a big mental game for me to try and let go of all that and hope for the best," she said. The uncomplicated and talented Smart Circle Cat helped build her confidence, and she knew "Woodrow," trained primarily by Tucker Robinson, was ready to step up to the challenge in Las Vegas. "He's amazing. I love that little horse. Tucker did a great job with him, and of course Teddy helping me doesn't hurt either," Robinson said, smiling. 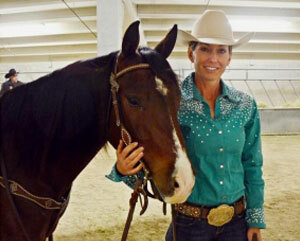 Tammy Jo Hays is an accomplished non-pro cow horse competitor with numerous titles on her resume, including the 2010 National Reined Cow Horse Association Derby Non-Pro Championship and the 2012 NRCHA Futurity Intermediate Non-Pro Championship. But the NRCHA Stakes had not historically been kind to the Nocona, Texas, horsewoman; she had never qualified for the Non-Pro finals at this event. Hays broke her Stakes curse with a vengeance in Las Vegas, Nev., when she rode her mare, Two Kitties (Smooth As A Cat x SR Jaguar) owned in partnership with her father, Walter Greeman, to the Stakes Non-Pro Championship with a total 646.5, earning $6,474. The title also came with a Bob's Custom Saddle, Gist buckle and CR Morrison Trophy from the NRCHA; a pair of boots sponsored by Rios of Mercedes; and a $50 gift certificate and cooler bag sponsored by Santa Cruz Biotechnologies. "I'm thrilled! I'm blessed beyond my wildest dreams," Hays said. "I'm really proud of my horse." The NRCHA Champion Sire Award, a $1,000 check and CR Morrison Trophy, goes to the Manion Ranch, who owns Two Kitties' sire, Smooth As A Cat, and enrolled him in the NRCHA Subscribed Stallion program. 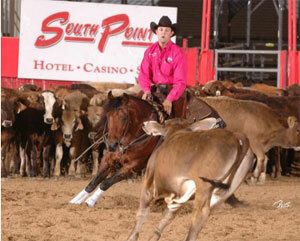 Hays and Two Kitties won the Stakes Non-Pro preliminary round and continued to dominate in the finals. Though they drew last in the herd work, Two Kitties impressed the judges to the tune of a 220, the high score of the round. The stellar work helped steady Hays' nerves, which she admitted were in overdrive as she prepared to compete. "I was more nervous than I have been in a long time, because I've never made the Non-Pro finals at the Stakes and I was last in the set," she said. "I thank God, my husband and my herd help - Chris Dawson, Robbie Boyce, Jake Gorrell and Jon Roeser. The herd work was the score that put me over the top today, and you cannot do this well without good herd help." Following her help's advice paid off for Hays in the herd wrok. The cows she selected were ideal for her cowy, talented mare. "There was nothing she didn't do perfect. She was always in the right spot. If you get her in the right position in the herd, it's easy to ride her," Hays said. In the rein work, Two Kitties spun and slid her way to a 213.5, again, the high score of the round. Hays said the stop is not the mare's strongest maneuver, but she makes up for it in almost every other way. "She turns around really big. I know that she's so good in the herd and down the fence, that if I can just get along in the reining, and plus my turnarounds, it might save me. She worked really well for me today. She was honest and quiet," Hays said. The judges whistled Hays a second cow in the fence work, and she was pleased with how Two Kitties handled it. "It was one I had picked in the herd, and I knew it was soft but would probably head. It did, to the left, and then we didn't have the best right turn, which was my fault - I should have ridden by and committed to that turn a little more, but then she followed through on everything else and made a good run," she said. Hays bought the quirky mare, nicknamed "Whiskers" for her loathing of clippers, in a trade for another horse and a couple of yearlings. They won the NRCHA Futurity Intermediate Open Championship together last year, and next on their show schedule is a trip to the Hackamore Classic in Pueblo, Colo., in May. 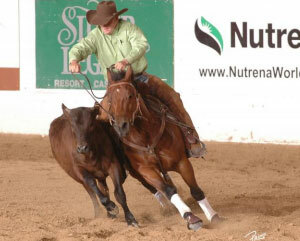 Stuart Bozeman, Idalou, Texas, hit the cow horse jackpot in Las Vegas when he claimed the Non-Pro Stakes Reserve Championship, the Intermediate Non-Pro Championship and the Novice Non-Pro Championship on Saturday, March 30. He also won the e Stakes Amateur Championship on Thursday, March 28. In the Stakes Non-Pro finals, rode Merada In Style 09 (Cats Merada x Stylish In White) to a total 639.5 score (213 herd/212.5 rein/214 cow) for a triple payday totaling $10,414. Bozeman also won three Gist buckles and two CR Morrison Trophies sponsored by the NRCHA, and a CowTrac mechanical cow system sponsored by CowTrac. Because Bozeman personally nominated Merada In Style 09's sire, Cats Merada, for the NRCHA Subscribed Stallion program, he also collected the $1,000 Non-Pro Reserve Champion Sire Award and the $2,000 Intermediate Non-Pro Champion Sire Award checks. In the Amateur division, the Champion was decided by the preliminary round scores, where Bozeman scored a 639.5 (217 herd/214.5/208 cow). The Stakes championship came with a check for $1,188, a Gist buckle and a C.R. Morrison trophy sponsored by the NRCHA. Bozeman also collected the $1,000 NRCHA Champion Sire Award. Multiple division sweeps are already becoming familiar for Bozeman, 30, who just started showing cow horses last year under the guidance of NRCHA Hall of Fame Horseman Don Murphy. 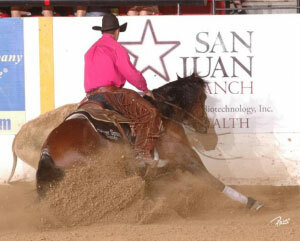 At the NRCHA Celebration of Champions Derby in San Angelo, Texas, in January, Bozeman and "Squiggy" swept five division championships - and the quiet-natured gelding takes all the showing in stride with minimal maintenance. "I switched feeds after San Angelo, and he's probably gained 100 pounds, and just filled out everywhere. When we got here, I just started feeding him three scoops instead of two, and if I go by the stall and see that he doesn't have hay, I give him some hay," Bozeman said. "I don't think I'd show him this much if he didn't act like he could take it. He's laid back. Nothing bothers him. He's never cranky." Bozeman, who farms and runs cattle on some leased ground, used Squiggy for outside chores as part of the 4-year-old gelding's early education. "I go check cattle on him. When I first got him, I used him all the time because he wasn't very far along [in training] and he was kind of lazy. I used him whenever it was time to go work, and he's pleasant to go ride around, too." Tyler Burkey, Milford, Neb., took the Amateur Reserve Championship aboard Survive These Lips (CD Survivor x Lipschic x Smart Chic Olena) collecting a check for $891. 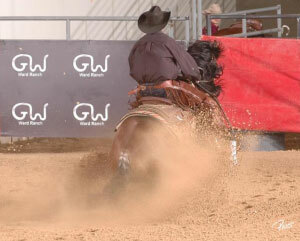 He also earned a place in all three Stakes Non-Pro division finals on Saturday, March 30.